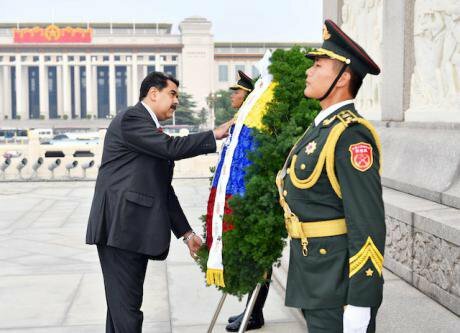 Venezuelan President Nicolas Maduro lays a wreath at the Monument to the People's Heroes at the Tian'anmen Square in Beijing, capital of China, Sept. 14, 2018. (Xinhua/Yin Bogu). PA Images. All rights reserved. An already volatile political situation in Venezuela escalated on January 23, as opposition leader Juan Guaidó declared himself interim president of the embattled South American country. The move by Guaidó, who was head of the National Assembly when its legislative power was transferred to a new Supreme Justice Tribunal packed with lawmakers loyal to incumbent Nicolás Maduro in 2017, has led to domestic unrest and international divisions. As head of the circumscribed former legislature, the US, Canada and some major Latin American economies - Brazil, Argentina, Colombia, Peru and Chile - have recognised Guaidó as Venezuela’s legitimate leader. Meanwhile, Russia condemned what it frames as his attempted power-grab and other countries, like Mexico, Uruguay and Germany, have called for a peaceful political negotiation that can lead to fresh elections. Most invested in Venezuela is China, which has provided loans worth over 60 billion dollars since the turn of the century. At stake, they and Venezuela’s other backers say, is the country’s national sovereignty and governance free from foreign interference. Beijing’s refusal to acknowledge the role its loans and diplomatic support have played in the slow deterioration of events in Venezuela hold valuable lessons. In a characteristically non-committal statement, Hua Chunying, a Chinese Ministry of Foreign Affairs spokesperson, said: “We call on all parties involved to be calm and rational, and seek a political solution under the Venezuelan constitution through peaceful dialogue. China supports the Venezuela government’s efforts to protect national sovereignty, independence and stability. China has always adhered to the principle of non-interference and objects to external intervention into Venezuela’s internal affairs”. China has provided political and financial support to Venezuela throughout its painfully slow descent into economic and humanitarian crises. But Beijing’s refusal to acknowledge the role its loans and diplomatic support have played in the slow deterioration of events in Venezuela hold valuable lessons that its decision-makers, and its international partners, would be unwise to ignore. In the spring of 2012, China’s biggest Latin America-focused think tank, the Beijing-based Institute of Latin American Studies (ILAS, part of the Chinese Academy of Social Sciences) invited me to give a talk on political risk in Latin America. The choice of topic was particularly intriguing given rising anxiety about the ‘Arab Spring’ and the threats it posed to China’s commercial interests in regions like Africa and the Middle East. Around the same time, China’s rapidly expanding oil, finance and diplomatic relationship with Venezuela’s Hugo Chávez roused some Chinese policy makers’ and think-tank researchers’ curiosity. Though political risk in the oil-rich country was new to me, I chose to present on the topic. From rising social and political polarisation to politicisation and mismanagement of the oil sector to Chávez’s growing health concerns, it was clear Venezuela presented more formidable political risks for any investor or lender, including China, than any country in the Western Hemisphere. Yet, although they noted the worrying trends in Venezuela, ILAS researchers ultimately felt China’s economic and diplomatic interests would not be adversely affected. Venezuela, they reasoned, had a lot of oil and China needed a lot of oil. China also had a lot of money to pay for it. The relationship is one of superlatives: Venezuela has the world’s largest oil reserves, China is the world’s largest oil importer and has lent more money to Venezuela than any other country in the world. Fast forward over six years and Chavez’s anointed successor Nicolás Maduro is scarcely two weeks into his hotly disputed second term as he finds his legitimacy challenged. Profound economic and humanitarian crises grip the country. The question of how China should understand and manage political risk in Venezuela has become one of the most important, if too often ignored, questions in China’s relationship with Latin America and in its broader efforts to be seen as development partner worldwide. The relationship is one of superlatives: Venezuela has the world’s largest oil reserves, China is the world’s largest oil importer, China has lent more money to Venezuela than any other country in the world. It has been characterised by larger-than-life personalities – at least on the Venezuelan side. It has long since become a debacle. The deepening crisis has attracted global headlines and concern. Yet China has neither acknowledged its role and interests in Venezuela’s crisis, nor sought to address the plight of one of its closest allies in the Americas. So how did we get here? And what does the current situation tell us about China’s ties with Latin America and its even more high-profile efforts at stimulating global development and South-South cooperation? On the surface, the China-Venezuela relationship fits into the broader pattern of raw materials-based trade, investment and financial ties with South America in the first decade or so of the 21st century. The China-led commodity boom from around 2003-2013 ushered in massive new trade flows of agricultural (soy), mining (copper and iron ore) and energy (oil) commodities from South America to China. It rapidly became the number one trade partner for countries like Brazil, Chile and Peru. Venezuela, with the world’s largest oil reserves, seemed a perfect partner for the world’s largest crude oil importer. Even as Venezuela has descended into crisis, China has at least officially continued to emphasise the natural “complementarity” of the relationship – a stabilising ballast amidst the storm. Yet from the beginning, the China-Venezuela relationship has stood out among all of China’s ties to commodity-rich countries, not just in South America but globally. Chávez and China’s “superbank”, the China Development Bank (CDB), together created a loans-for-oil and diplomatic partnership that aimed to showcase the possibilities of South-South cooperation ushered in by China’s emergence as a global actor. Instead, it serves as a cautionary tale of hubris and unintended consequences. In Venezuela, Chávez saw China as a crucial partner in efforts to control the nation’s abundant oil supplies and implement radical domestic and foreign policy agendas. Not only did expanding exports to China fit Chávez’s rhetoric of diversifying away from export dependence on the US, but massive loans-for-oil deals with the CDB (40 billion dollars prior to his death in 2013) provided a steady supply of economically and politically exchangeable funds that no other international creditors would or could provide. By emphasising China’s socialist and revolutionary bona fides (faded or imagined as they may be), Chávez also found a convenient, if reticent, partner in his Bolivarian Revolutionary agenda at home and abroad. On the Chinese side, another largely practical trade and investment relationship with a commodity-rich South American country soon turned into something quite different. Instead of buying Venezuelan oil as India has done, China’s state-owned CDB set up a series of multi-billion dollar loans-for-oil deals. These loans still constitute China’s largest outlay of finance to any other country. What has followed Chavez's death in 2014 and the plung in oil prices has been a disaster for the people of Venezuela and has also undermined every element of China’s interest in the relationship. Part of the CDB’s eagerness to lend to Venezuela in the years under the leadership of Chen Yuan, the seemingly untouchable president and Chinese Communist Party scion, is explained by trying to establish its credentials as China’s principal financier of global energy deals. It was no coincidence that the largest loans, including one for 20 billion dollars in 2010, came as huge new sources of liquidity sloshed around the Chinese financial system in response to the global financial crisis. Chávez and the CDB convinced themselves that theirs was an economically and politically astute and viable partnership. But even in 2012, a growing sense of unease about Venezuela was spreading in Beijing, including concerns about Hugo Chávez’s ill health. Chávez died in 2014 and was replaced by a leader in whom China had far less confidence. Add to that, the global price of oil had plunged. What has followed has been a disaster for the people of Venezuela and has also undermined every element of China’s interest in the relationship. The near complete meltdown in Venezuela’s oil production means its government has been unable to service the original terms of the more than 60 billion dollar loans. There has been a de facto default and fewer than the agreed oil shipments to China. Worse, Venezuela’s oil production crisis has contributed to a rise in global prices, raising China’s total oil import bill. From almost every possible angle, the China-Venezuela relationship has become completely dysfunctional for the governments, businesses and citizens of both countries. Unsurprisingly, neither the Chinese nor Venezuelan authorities publicly acknowledge that their relationship has failed to live up to the high expectations set over a decade ago. China has dramatically scaled back the scope of its lending in recent years, but at each new sign of Venezuela’s further descent into crisis, Chinese foreign policy leaders make formulaic statements about their hopes for “stability” in Venezuela. Venezuela remains an important test case for how Chinese researchers as well as government and business officials understand, or misunderstand, political risk in Latin America and beyond. China has refused to play any public role in Latin American regional efforts, such as through the Lima Group, to help Venezuela find a more sustainable path forward. China has washed its hands of the crisis it first facilitated and then failed to help resolve. Beyond what has gone wrong with China-Venezuela ties, their relationship has broader, too often underappreciated, implications. It is clear Venezuela remains an important test case for how Chinese researchers as well as government and business officials understand, or misunderstand, political risk in Latin America and beyond. There was a strong belief in China that complementary oil-based linkages, grounded in seemingly unshakeable ties between Venezuela’s paramount leader and one of China’s state-banking champions, could not be derailed. Both parties believed that through loans-for-oil deals, China would both guarantee oil flows and loan repayments while remaining immune from any vicissitudes of Venezuelan economics or politics. All these assumptions have been upended in Venezuela. Yet China has made similar choices in supporting other resource-rich developing countries in Africa and Asia. It’s hard to find another equivalent of Chávez’s Venezuela, but Mugabe’s Zimbabwe or Hun Sen’s Cambodia offer parallels. The massive debt-based relationship that China built up with Venezuela is a warning sign for debtors and lenders alike as China seeks to extend its Belt and Road infrastructure plan. In the more than six years since that original ILAS presentation, I have been writing, speaking and teaching about the slow-motion train wreck that is China-Venezuela relations. Certainly, the US has made bigger mistakes in Latin America and elsewhere, but something must change. As a country that is working to improve climate governance both at home and abroad, China must engage with Venezuela to think of innovative ways to develop the country’s oil resources in a sustainable way.Given China’s growing role as an important energy and infrastructure lender, a more honest acknowledgement of its experience in Venezuela is required. China’s foreign policy and bank officials should embrace a more sensitive and empathetic approach toward Latin America and other developing regions. Only then, might they avoid the same mistakes other global powers have made. As I reflect on years researching and writing about China and Venezuela and of teaching in a Chinese university (I left Tsinghua University last summer), it strikes me that even though I gave what I viewed as a constructively critical view, not once have I been directly or indirectly challenged. In fact, the opposite was true, even in think-tank conferences, media interviews and other fora. This may come as a surprise given China’s well-deserved reputation for sensitivity to criticism of its foreign policy or for the lack of intellectual freedom in public institutions. They listened politely, but China’s foreign policy and bank officials should embrace a more sensitive and empathetic approach toward Latin America and other developing regions. Only then, might they avoid the same mistakes other global powers have made. This article was previously published by Diálogo Chino. To read the original version, click here.